Super-Scrub is a non-lotion cleaner used primarily for the removal of Super-Krete S-1710 Liquid Release Agent™ residue from stamped concrete and stampable overlays. 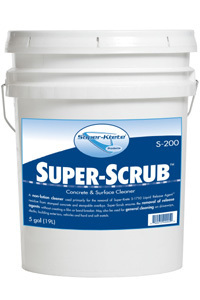 Super-Scrub ensures the removal of release agents without creating a film or bond-breaker. Super-Scrub may also be used for general cleaning of driveways, decks, building exteriors, vehicles and hard and soft materials. Approximately 6000 sq. ft. per gallon when diluted as instructed (1:20 parts water).